Latest edition Toyota Avalon hits all the right marks. After three consecutive weeks of driving hybrid electric vehicles, little did I know that the best one would be saved for last. While the Toyota Prius and the Lexus CT 200h both have a place among hybrids — the Prius for starting it all and the Lexus for embellishing the segment — the Toyota Avalon Hybrid may just be the cream of the crop. The fourth generation Toyota Avalon now offers a hybrid line. 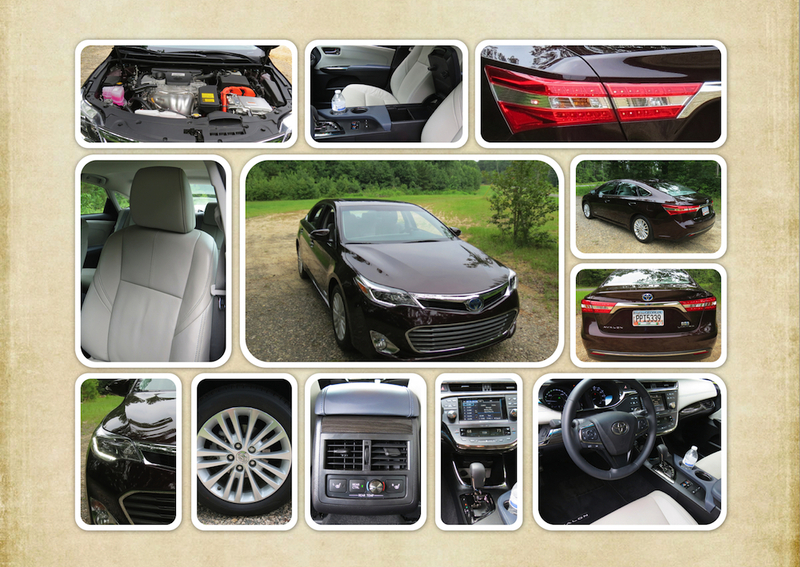 A 2014 Toyota Avalon Hybrid Limited edition closed out my string of electrified models just this very week. It is a large sedan and is now in its fourth generation. Beginning in 2013, Toyota added a hybrid model to the Avalon line. That model joins the Camry Hybrid, the Prius family and a Highlander Hybrid. Toyota not only owns the hybrid market, but it continually seeks to redefine it. This was not my first go around with the Avalon either. Last fall, I spent a week with the 2013 Toyota Avalon XLE Touring edition, finding an “attractive, competent” sedan serving as Toyota’s flagship. It had the right engine, a comfortable suspension, attractive exterior looks and generous cabin amenities to deliver a classy ride. I understood that marrying these attributes to a hybrid powertrain would certainly change one thing: its performance would be sacrificed in the name of fuel efficiency. Indeed, the Toyota Avalon Hybrid (priced from $35,555) is powered by a 2.5-liter four cylinder engine. I am not a big fan of small engines in larger cars unless they have direct injection or a turbocharger. Both are preferred. A 156 horsepower rating is not a lot to work with, but with its electric motor, the total output rises to 200 hp. Moreover, this powertrain makes 199 foot-pounds of torque. So, while coming in slower than the V-6, the hybrid system does something that no other big sedan can deliver: nearly 40 mpg fuel economy. We’ll take a closer look at the performance numbers a bit later. First, we’ll look at the Avalon’s history. Second, we’ll review the model at hand. The Avalon made its debut in 1995, the first large sedan to wear a Toyota nameplate. Toyota had been building big cars in Japan for years, but concentrated on the lower end of the market for the US before expanding and moving up. Even then, it chose to launch its premium Lexus brand five years earlier, including its very first large sedans. In the Avalon, Toyota targeted Buick, especially its LeSabre sedan. The new Avalon was warmly received by the senior set and its place in the Toyota portfolio was assured. Even so, for three generations Toyota served up Avalons that were luxurious, but bland, effectively holding down the model’s sales potential. 2014 Toyota Avalon Hybrid Limited. The 2013 edition maintains a habit that has worked well for Toyota in the past: take the highly competent Camry platform and stretch it to accommodate the Avalon, adding nearly two inches to the wheelbase and six inches overall. The side overhangs are slightly wider too, but the Avalon sits nearly a half-inch closer to the ground. The practice of platform sharing is much more common these days than what you might realize. In the Avalon, you probably won’t notice the Camry relationship — nor should you care. The fourth generation Avalon assumes the styling convention of current Toyota models. Its signature grille is flanked by standard quadrabeam headlights (HID in the Limited). The most pronounced feature, however, is its oversized air intake/lower grille, itself flanked by fog lamps set within scalloped recesses. That intake is surrounded by brightwork trim, what provides an elegant look. Overall, the Avalon Hybrid advances a much more vigorous look. Imposing profile characteristics, including rocker panel embellishments put forth a more stately look. The roof line sweeps back to the trunk’s edge, to advance its upscale pedigree. Attractive and stylish wrap around tail lamps and dual chrome finishers enhance this model’s rear look. Toyota sells the Avalon Hybrid in XLE Premium ($35,555), XLE Touring ($36,750) and Limited ($41,400) trim levels. Each one adds from $1,500 to approximately $2,400 to comparable standard models, not a bad mark up for a hybrid. Keep in mind that you essentially downgrade the engine to win hybrid efficiencies. The Premium and Touring editions come equipped with standard dual-zone climate control and rear seat vents. The Limited edition brings in three-zone climate control to permit rear seat passengers to adjust same. The infotainment package in the Limited offers all the bells and whistles you want including an 11-speaker GreenEdge audio system with SiriusXM satellite radio, HD Radio with iTunes tagging, voice recognition and Bluetooth wireless technology, among other features. That represents an upgrade over the standard eight-speaker audio system found in the Premium edition and the nine-speaker system standard in the Touring edition. All models are outfitted with a backup camera and cruise control. Dynamic radar cruise control, often marketed as adaptive cruise control in some models, is available with the Limited only. This technology ensures that you maintain a safe distance between vehicles as you move down the road regardless of cruise setting. The instrument panel is clear and easy to configure, featuring analog and digital displays. Instead of a tachometer, you get an “EVometer” what tells you when the vehicle is operating in charging, eco or power modes. To the right is the speedometer and in the center is the driver information center — check the various driver information such as trip, distance to empty, average fuel economy and other information by flipping the switch. Other standard features include: wood grain style interior trim with smoked chrome interior accents and door handles, ambient lighting, keyless entry, push button start, power accessories, automatic headlamps, three 12-volt outlets and four cup holders. Leather seating is standard across the Avalon line and is upgraded to perforated leather in the Limited. The top-of-the-line Avalon Hybrid provides a 10-way power driver’s seat with lumbar support and power extension, and an 8-way passenger seat. Heated and ventilated front seats are standard with heated rear seats (outboard position only) standard in the Limited. As far as seating comfort, the Limited provides what you expect, but not a lot more. The bucket seats are not very well bolstered, but there is no need for that: spirited driving is hardly possible even when operating in Sport mode. In the Limited, the front lip of the driver’s seat also expands out, providing improved thigh support. The rear seat is very comfortable and holds three adults with ease. It offers three adjustable headrests and has a fold down arm rest with cup holders in the middle place. What it doesn’t do is recline or fold down, a feature found in the most recent edition. The Avalon’s 14 cubic-feet trunk space is small for the class too, so keep that in mind if your storage requirements are significant. Highlander Hybrid, anyone? On the road, this vehicle performs as expected. You get the cushy ride and a quiet interior. You won’t get a lot of power, but you may be surprised when you step on the accelerator and the sedan moves steadily, if not briskly. One short trip taken with my family of four revealed a few things: the Avalon Hybrid can get up to highway speeds without sounding like it will break. Simply shift the driver mode to sport and you’ll enjoy better handling. Once you are at highway speeds, shift into “eco” mode and engage the cruise control — you’ll want to see how close to 40 mpg you can get. My weeklong journey with the Avalon Hybrid yielded 36.6 miles to the gallon. I am sure that I could have squeezed more miles out of the sedan, but I was satisfied with what I got. Heck, there are some compact models that struggle to get 35 mpg and in the Avalon Hybrid you get the best of Toyota’s luxury touches thrown in. 2014 Toyota Avalon Hybrid photos copyright Auto Trends Magazine. All rights reserved.